LoveandSeek.com helps to build both platonic and romantic relationships between Christian men and women through a range of online features that are both fun and safe to use. It's free to join the site, create a profile and search. 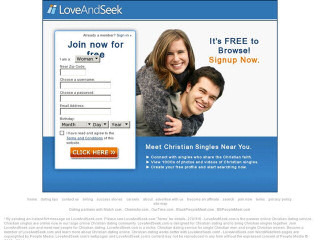 Love and Seek is a place for Christian singles to meet and mingle online. This basic website works to connect people and build relationships using things such as photo uploading, email, chat, video and audio greetings and many others. You begin by creating a profile by going through a step-by-step questionnaire. Once that's done you can use the search option to find potential matches nearby or worldwide. This is a pay site: To further enhance your online dating experience, you have to go for a paid subscription to the site which provides the privileges you'll need to meet people. In addition to being able to send and receive unlimited emails with a paid membership, you can also have your profile highlighted in order to get noticed more often. LoveandSeek.com is nonexclusive and welcomes individuals of all faiths to join the site. Features such as virtual flirt messages, birthday listings and success stories help to enhance the online dating experience. Subscriptions come in one or six month increments, both of which are discounted on a regular basis for new members. Rss Feeds. Subscribe to comments for this site. [?] Receive updates about Loveandseek.com directly through your newsreader. I met my wife on here and we living life to the fullest. I thank God for that I think I think any of you can join too to experience real love. You don't have a confirmation email for this site, and it caused a problem in my relationship I think that this site is shady and unprofessional. I haven't even gotten signed up yet, but noticed in my free- time, the men are all United States of America, since I live in Canada this seems highly irregular---not to tell a person this in the beginning.... read most that was available. Not good for word of mouth pr....signing out right now. I subscribed for one month they charged me for six month and then another $18.65. I want you to cancel my subscription at once. Why do you have so many dishonest men on your site? All the men i have come across here are liars, scammers and having false profile. Does it mean you guys just call this a Christian Site when they do worst things to innocent women more than any other site? This is horrible. I have not met any honest or truthful man on this site. I was tricked into sending $100.00 to a man last month. Little did i know that he was a Con Artist. Is there no way this can be stopped? Does this mean that this site was created for this type of people or business? I don't know because over 15 men cannot be the same unless this is what it portrays here. I don't understand this. Can you explain this to me? Why do all the men i have met on this site the past two months doing the same thing and don't have any authentic phone number or are telling stories to get money from me? Why? I don't understand this because it is not a coincidence at all. I recently joined and wish I had seen these comments before doing so. So far the majority of the messages I've received have been from better-than-average looking men who have a master's or doctorate degree(oddly, they can't spell punctuation, let alone use it) who think I'm the most beautiful woman they have ever seen, and make over 100k per year. Right....... I have some really lovely swamp land in Florida for sale too! The only REAL person I've encountered so far was admittedly not Christian, but honest about it (wow, refreshing). Don't waste your money here. I totally agree. I was set up and sneared big time by some individuals there. In the end they turned the cards against me, when I had discovered their games, made it all to look my fault. It's truly not a Christian site. It was waste of money, time and character assassination. Better take this seriously pls, because it is that serious. I recently joined LoveandSeek.com, and within the first week, I was contacted by 5 different men claiming to work in or heading to work in Nigeria. It set warning bells off in my head. I was contacted by a man from LA. We chatted and emailed for about a week, when he claimed to be madly in love with me. I asked him to come and visit me and he suddenly got a contract to work in the UK. He promised to visit me when he returned stateside. He then asked me to open up a checking account for him on ingdirect.com because he is an Italian citizen and cannot open up an account with a US bank. Needless to say, I am no longer on LoveandSeek.com. It is a hotbed chocked full of scammers. This purports to be Christian for Christian dating. It is, however, as hypocritical as you can get. There are several gross ethical infractions, some of which are violating laws or regulations. One, the site solicits married individuals. Any dating site which does this is highly unethical, and to be "Christian" is unimaginable. These "Christians" are destroying families, marriages and leaving children with broken homes by seeking married people as their members. It is the utmost antithesis of Christianity. Furthermore, these married people in their clan have got to be lying about their marital status, and embroiling legitimate members into a hideous situation. A second highly unethical behaviour of this dating site is its definite practice of spamming email accounts. Their spam is obnoxious, intrusive and highly annoying, violating the peace and privacy of countless email recipients. Again, the antithesis of Christian behaviour. What Christian would be so disgusting, egotistical and have blatantly no regard for anyone else's peace. I recommend everyone to run from them, never join them, and never trust them. They have nerve calling themselves Christian. They are breaking spam laws, being as unethical as they can, and are, thus, nothing but a bunch of hypocrites. LoveandSeek.com 1.67 18 A review of LoveandSeek.com. LoveandSeek.com helps to build both platonic and romantic relationships between Christian men and women through a range of online features that are both fun and safe to use.